If there’s been one social media website I’ve been the most involved in, I would have to point at Tumblr in response. Without question, it is a comparatively different social media platform than the more well-known platforms like Facebook and Twitter. While these choices are more than essential for growth, not only for individuals but entire businesses as well, there’s a unique form of expression that exists on Tumblr and its CEO would be hard-pressed to argue. In fact, according to an article on BBC, Tumblr CEO David Karp said that it may be the most expressive platform on the Internet. He said that Tumblr allows its users to have, “…complete control of how you present yourself,” meaning that they can showcase their true personalities on the website, whereas other platforms may not present that opportunity as clearly. Much of this expression comes in the form of art. For those who haven’t visited Tumblr, or perhaps never heard of the site until now, one of its most favorable types of posts are known as .gif sets. These posts consist of multiple .gifs, many of which are made with hue-altering filters. Tumblr is also home to more unique forms of art, paintings and drawings being some of the most favorable. Art styles help to drive Tumblr’s appeal but it would be a lie to say that this is the only element of the appeal in question. In fact, Karp mentioned that Tumblr has been able to elicit, “…a real dialogue about what comes next,” following events in the news. For example, if you were to go on Facebook, you might see various posts about a certain piece of news but no commentary to add. Tumblr, on the other hand, has shown that conversations can occur in relation to news stories. Viewpoints may differ – this is common on any platform for discussion – but the fact that they are allowed is positive, to put it simply. With these points in mind, I have to wonder how Tumblr will expand come 2015. As I’ve stayed engaged on Tumblr throughout 2014, I’ve seen many issues brought to the forefront and various interests discussed in great detail. 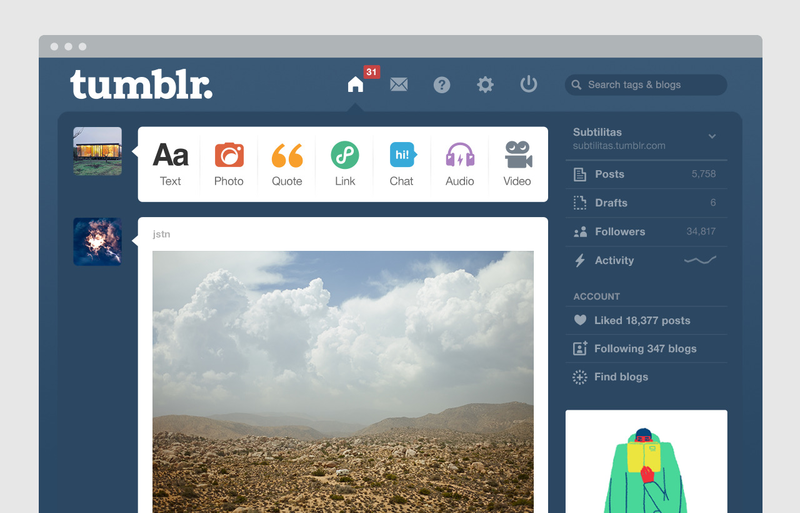 While engagement is crucial, there is still the business side of Tumblr to take into consideration as well. Fortunately, I see nothing but good things for this brand’s future. Other companies have taken to Tumblr and reached out in order to attain a slice of the proverbial pie. For example, on January 1st of the new year, Netflix will be launching a “tie-in site” on Tumblr. The details of this website are scarce but one has to believe that it will serve promotional purposes, more than anything else. Whatever the case ultimately winds up being, the fact that a brand as big as Netflix has recognized Tumblr’s value gives me hope that 2015 will be another year of growth, which will be observed by social media and online marketing firms alike. Have a Happy New Year, everyone, and I’ll see you all in 2015!